The Treasure Nile have 9 pay lines and 5 Reels to increase your chances to win with a massive 35 winning combinations including the scatter pay. This is the slot machine that should not be missed. If you are looking for a big jackpot win we highly recommend you playing all 9 lines because the progressive jackpot is only available on the ninth pay line. With a coin size of $.5 you will have to play a max 9 coins or $4.5 each spin to qualify for the progressive. The large amount of winning combinations really keeps you playing longer and gives you more chances to hit the jackpot. The slot has the wild Pyramid symbol that comes in very handy filling in those combinations. The Pyramids symbol substitutes for any other symbol to complete winning combinations. It can substitute for all other symbols except the Scarab and Pharoah symbols to complete winning combos. Treasure Nile video slot is the first online game to feature a "Scatter Pay", this means that if you hit 3 or more beetles anywhere on the reels you win. The largest ever won jackpot on Treasure Nile is $520,625.09. 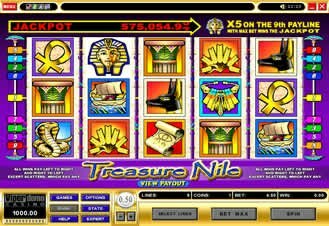 If you have not played Treasure Nile yet, we highly recommend that you check out this slot today, this is definitely one of the best 5 reel, 9 pay line progressive games. We would also recommend you seeing over 100 Treasure Nile winners stories and interviews with real online progressive jackpot winners.